It’s not an easy topic but it’s important for owners to be guided on how to assess the quality of their pet’s life when they are old, disabled, or very ill. At the Wonderland, we have cared for 14 years olds as well as chronically ill rabbits. However, we may not give up on them. 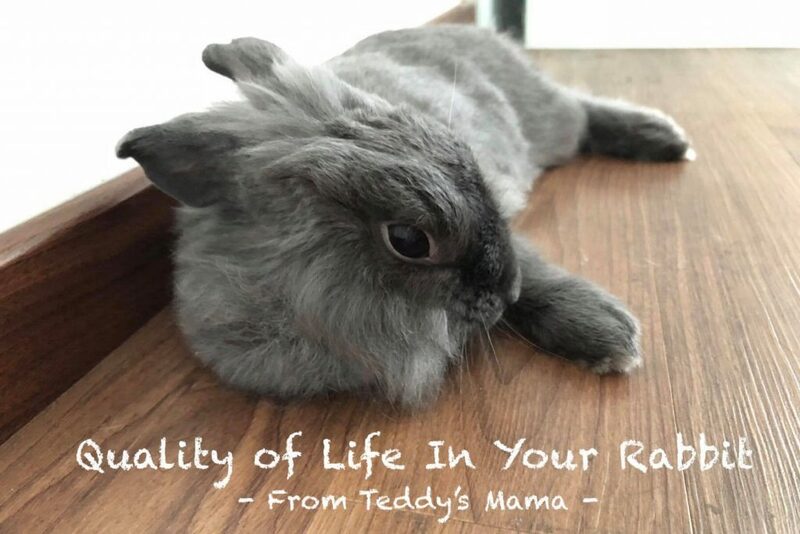 Here’s some considerations to determine if the rabbit is still living his life to the fullest or if his quality of life is indeed compromised. A happy rabbit will continue to have a good appetite and will crave for food. While the rabbit may not be well enough to chew on his usual meals, if he is still excited about his pellet ‘porridge’ and loves his treats, he is still a jolly good fellow. On the other hand, a rabbit who refuses food may not have a very good prognosis going forward. Senior or unwell rabbits may not be able to stay as active as they used to be. However, our rabbits are extremely adaptable and will thrive with our support. We have cared for immobile rabbits in well-padded baby cots as well as built wheels for the disabled. You will be surprised how well they handle it and continue to live their life with zest! Our rabbits love to stay clean but they may not be able to maintain hygiene with their current condition. Owners can manage through using incontinence pads, more regular grooming and more cleaning. This does take a toll on the caregiver but if the rabbit remains comfortable, it will make a big difference to sustaining the rabbit’s overall well-being. Our rabbits have extremely high tolerance which makes it hard to tell when they are truly in pain. It is important to work closely with a savvy vet to determine if the rabbit is indeed suffering. Pain management includes medication, physical therapy and alternative treatment such as acupuncture or laser. Owners should have realistic expectations and plan their finances accordingly. Is the rabbit still as curious and cheeky as he was? Does he still enjoy hiding in his favorite box? Does he still cuddle with his beloved companion? If your rabbit is still drawing joy from his daily life, we as their owner should also continue to keep a positive outlook. As long as the good days outnumbers the bad ones, we should recalibrate our norm and accept them in the new way they are today. To our founders, as long as our rabbits still enjoy their food, their companions and in good spirit, we will not give up on them. The day they no longer have the spark in their eyes, we will hold them close and tell them it’s ok to let go. We work closely with our vets to decide if we need to lend them a hand. Regardless, if we do make a decision, we must always have their best interests at heart.